Nancy M. Kiskis, an attorney with our wealth preservation and estate planning team, is intimately familiar with Alzheimer’s disease and what it does to caregivers and families. Her husband was diagnosed with Alzheimer’s at the age of 56. After eight years of agonizing decline, he died at the age of 64. But the story doesn’t end there. Nancy and her children, Alisa and Ryan, have become advocates for funding to find treatment and a cure for Alzheimer’s. Although Alzheimer’s disease is the sixth leading cause of death in the United States, it is the only disease in the top ten that has no treatment and no cure. If nothing is done, Alzheimer’s disease alone will bankrupt Medicare in just a few short years. Her husband’s death has spurred Nancy to get involved so that a cure or at least treatment to slow the disease can be found. She attends the Alzheimer’s Forum in Washington, D.C., every spring to learn more about research and then lobby on Capitol Hill. 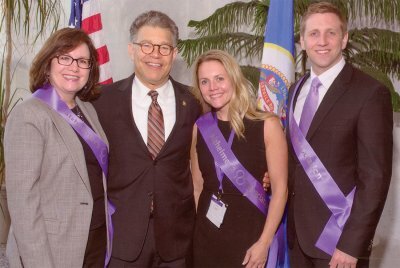 She and the Minnesota delegation, as well as delegations from around the country, meet with their Senators and Representatives to educate them about Alzheimer’s and impress upon them the urgency in finding treatment and a cure. Nancy is the Alzheimer’s Association ambassador to Senator Amy Klobuchar. In addition, Nancy serves on the Public Policy Committee of the Alzheimer’s Association Minnesota/North Dakota Chapter which focuses on not only federal legislation, but also efforts at the state level. She also serves on the Sustaining Caregivers Committee of ACT on Alzheimer’s, a statewide initiative that is educating communities on understanding and supporting persons with Alzheimer’s and their families. Nancy’s daughter, Alisa, after attending the Alzheimer’s Forum in D.C., was so moved that she started looking for a way to get people her age involved in the fight. 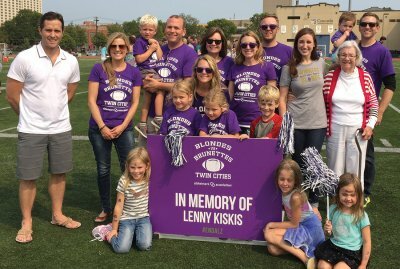 Alisa is one of the co-founders of Blondes vs. Brunettes Twin Cities, which is a friendly, but competitive, flag football game pitting age-old rivals – blondes and brunettes – and raises funds for research and support for persons with Alzheimer’s. To date, B vs. B has raised over $300,000 and leads the country in funds raised in its inaugural year. Ryan, Nancy’s son, serves on the Alzheimer’s Public Policy Committee and is Co-Chair of the Advocacy Committee of the Young Champions, a group of young professionals whose goal is to raise awareness about the disease and fight for a cure. Ryan was one of the key speakers at Rally Day held at the Minnesota Legislature last year. In many ways, the death of Nancy’s husband was not an end, but a beginning. Her experience as a caregiver has given her a unique understanding and the opportunity to help others, not only by lobbying on Capitol Hill for more funding so that a cure can be found, but in helping others who are also traveling this path, whether as caregivers or as persons struggling with Alzheimer’s. Nancy Kiskis and her children, Alisa and Ryan, with Senator Franken at his office in Washington, D.C.